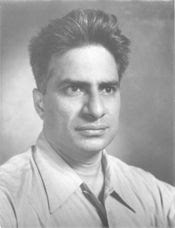 Both D. D. Kosambi (1907-66) and Debiprasad Chattopadhyaya (1918-93), two leading Marxist thinkers in India, discussed at length the teachings of the six heretics and of the Buddha during the sixth/fifth century BCE in their seminal works, An Introduction to the Study of Indian History (1956) and Lokāyata (1959) respectively. It will be interesting to compare and contrast their views and observe how, in spite of their basic similarity of approach, they arrived at almost opposite conclusions in the 1950s. It may also be stated in advance that Kosambi did not radically alter his views in his last work, The Culture and Civilisation of Ancient India in Historical Outline (1965), although he added much that was new. On the other hand, Chattopadhyaya gradually modified his views and came to a more appreciative assessment of the six heretics and the Buddha. His last work, History of Science and Technology in Ancient India, Vol. 2 (1991) records his mature opinion of these thinkers. Kosambi, as is well-known, was not primarily interested in philosophy and in his magnum opus does not deal with the later developments of the orthodox (āstika) and heterodox (nāstika) systems. Yet he dealt with the six heretics and their legacy (as also of the Buddha) in some detail and tried to account for both their origin and extinction. Quite naturally the Buddha gets the lion’s share in his discussion but other thinkers are not treated cursorily. Kosambi summarizes their teachings and assesses their views against the backdrop of the transition from tribe to state, from a pastoral economy to an agricultural one and what constituted the Buddha’s pre-eminence ((1956/75), 162-171). Chattopadhyaya’s study in 1959 was directed to a single question: Why did the teachings of the Buddha’s contemporaries, especially the major five of the so-called sixty-two heretics, fail to survive while the teachings of the Buddha succeeded? Chattopadhyaya’s answer was: The Buddha had provided the right illusion to replace reality which his other contemporaries could not (506-07). In this connection Chattopadhyaya refers to Kosambi but does not seem to notice his observation on the significance of majjhimā paṭipadā , the Middle Way ((1956/1975), 165). I have already mentioned that Kosambi and Chattopadhyaya, in spite of their basic similarity of approach, had initially arrived at almost opposite conclusions in the 1950s. The starting point even then was the same: transition from the pre-class society (tribe) to the class-divided society (state). Yet Chattopadhyaya harped on the illusory nature of the Buddha’s teachings and the element of despair and frustration common to the five of the chief heretics. Kosambi, on the contrary, found many more positive elements in the teachings of the Buddha and the six heretics as evinced in the continuity found in later developments of Indian philosophy. Chattopadhyaya too came to the same conclusion much later, only in 1991, when he studied the philosophical systems in relation to the history of science and technology in ancient India. Let us now concentrate on how Kosambi viewed the advent and historical significance of the six heretics and the Buddha. Kosambi lays much stress on the rise of so many heretical views all at a time in ancient India at a particular juncture of history. He notes that the kings of those days “were deeply interested in religious matters and protected these sects” ((1956/1975),163). “It follows,” he says, “that the new beliefs were the expression of some urgent needs, some change in the productive basis” (164. Emphasis added). In this connection Kosambi mentions the rules of the Buddhist saṃgha in particular and observes: “The Buddha himself followed the rule till his death at the age of eighty. His disciples went along new trade routes, even into the tribal wilderness, bearing the message of peace, but coincidentally the influence of Magadhan trade. Because they preached in the people’s languages, they lived closer to the people than the brahmin with his monopoly of the obscure vedic Sanskrit” (168-69). Kosambi feels that the Buddha provided a ‘new religion [that] was the exact parallel, for the same economic reasons, of the move towards “universal monarchy”, the absolute despotism of one as against the endlessly varied tyranny of the many’ (169). Moreover, “brahmin ritual (sc. yajña, animal sacrifice) then served only the kings, nobles, chiefs or rich traders, but had very little use for the common man in contrast to the later fully developed brahmin priesthood which performed even the most trifling ritual for anybody for inconsiderable payment.” 5 The Buddhist doctrine, on the other hand, ‘called itself “Aryan”, thus admitting the right of indigenous tribal elements and lower castes to ennoble themselves merely by just action, contrary to brahmin theory’ (169). Ethical code in place of magic ritual, frugal way of livimg instead of ostentatious display of wealth in performing costly sacrifices, and such like features are common to all the heretical doctrines, not exclusively of the Buddhist saṃgha. What then made the Buddha pre-eminent of them all? Chattopadhyaya’s answer was: the Buddha had provided the right illusion of the epoch which his other contemporaries could not. Kosambi does not think in terms of illusion and reality at all. Before getting into this issue he first frames an altogether different question: Why did so many alternatives to the Vedic religion rise in one narrow region in eastern India rather than in the strongholds of the Vedists? Kosambi then goes on to relate the rise of new religions (not only of Buddhism) to the rise of new classes in the Gangetic basin. There were free peasants and farmers there. “The neo-Vedic pastoral class of vaiśyas within the tribe was replaced by agriculturist for whom the tribe had ceased to exist” (100). Traders had become so wealthy that the kings also used to treat them with respect. The key to the change in society as a whole was the origin of private property in farm animals, in land and its produce. Killing of cattle in ritual sacrifices was now frowned upon and embodied in the doctrine of ahiṃsā, non-violence. “How completely the sixth-century reform drove this [Vedic sacrifice of cattle] too out of fashion is seen by the absolute Hindu tabu upon cattle-killing and beef-eating…. A modern orthodox Hindu would place beef-eating on the same level as cannibalism, whereas Vedic brahmins had fattened upon a steady diet of sacrificed beef” (102). Moreover, “the new eastern teachers rose above all ritual and broke the strongest tabu by eating cooked food from the hands of another caste however low, or even left-overs of soiled food” (103). “The leaders of the various innovating sects and their monkish followers (not the lay believers) gained their livelihood mostly by alms. This was at base reversion to food-gathering….Celibacy and abstinence from holding property made the new teachers much more economic than greedy fire priests in an acquisitive society” (103-04). This doctrine of the Middle Way then marks the superiority of Buddhism over all other anti-Vedic religions of the times. It did not provide an illusion but a viable way of life, no less real than the others. Not only this, Kosambi considers the Noble Eightfold Path (ārya aṣṭāṅgika mārga) to be the core of Buddhism. This is why Buddhism was “the most social of religions; the applications of its various steps are carefully developed and expounded…” (106. Emphasis added). The early monks “would accompany caravans, but even then passed the night outside the camp. The Buddhist monk was forbidden labour for profit and for agriculture, having to live on alms or by gathering food in the forest without the taking of life; only thus would he be free to concentrate upon his social duties, the obligation to lead all to the proper Way“ (107. Emphasis added). It was not merely the attainment of personal nirvāṇa that guided the Buddhist monk; his social mission is of cardinal importance. These features of Buddhism explain why it succeeded in its mission while other heretical doctrines could not. The Arthaśāstra king owed nothing to anyone; his sole business was to rule for the profit of the state, with efficiency as the one ultimate criterion. With Asoka, the social philosophy expressed in the sixth-century Magadhan religions had at last penetrated the state mechanism ((1965/1972), 158). At the same time, Kosambi does not fail to notice the basic limitation of this new philosophy in a backward society: “What it could not give was limitless scientific and technical control over nature with the benefits to be shared by all mankind according to individual and social need” (114). That the doctrine nevertheless continued to grow even after the Buddha’s death is “because it was eminently fitted to the needs of a rapidly evolving society” (114). 1Kosambi says all this in his later work in less detail ((1965/1972), 104-05). For Chattopadhyaya’s views see R. Bhattacharya 2010. 4For a more detailed discussion of negation and the negation of negation, see R. Bhattacharya 2009. 5In his later work (1965) Kosambi says the same in another way: “The yajña was ended for the easterner in all but theory; the brahmin of the future would eventually agree to serve all castes as priest and to adopt new worships to old forms in order to gain his livelihood – paying lip service to the Vedas all the while” (1965/1972),104. 6Katherine Osborne has recently provided a short but lucid account of the Presocratics. The classic Marxist account by George Thomson is still worth studying. 7See, for example, Ram Bilas Sharma’s very “left-wing” but largely pointless study and contrast it with Kosambi’s. It is rather strange that nothing of Kosambi was included in a collection of essays entitled Buddhism: The Marxist Approach. Basham, A. L. History and Doctrine of the Ājīvikas. Delhi: Motilal Banarsidass (MLBD), 1981 (first pub. 1951). Bhattacharya, Ramkrishna. “Basham, Kosambi, and the Negation of Negation”, Psyche and Society (Kolkata), 7:2, December 2009, pp. 71-75. Bhattacharya, Ramkrishna. “The Buddha and the Six Heretics: How Debiprasad Chattopadhyaya Viewed Them”. Psyche and Society. 8: 2, December 2010, 17-21. Chattopadhyaya, Debiprasad. History of Science and Technology in Ancient India, Vol. 2, Calcutta: Firma KLM, 1991. Chattopadhyaya, Debiprasad . Lokāyata: A Study in Ancient Indian Materialism . New Delhi: People’s Publishing House (PPH), 1959 (third edition 1973). Dhammacakkapavattana sutta in Saṃyutta Nikāya (5. Mahāvagga), ed. Jagadish Kasyap, Patna: Pali Pulication Board, 1959, p. 361. These four ariyasaccas are also mentioned in some other suttas that follow (pp. 363 ff.). Kosambi, D. D. An Introduction to the Study of Indian History. Bombay: Popular Book Depot, 1956 (Revised second edition. Bombay: Popular Prakashan, 1975). Kosambi, D. D. The Culture and Civilisation in Ancient India in Historical Outline. Delhi: Vikas Publishing House, 1972 (first published 1965). Mahāvastu Avadāna. Ed. Radhagobinda Basak. Vol. 3. Calcutta: Sanskrit College, 1968. Norman, K.R. A Philological Approach to Buddhism. The Bukkyō Dendō Kyōkai Lectures 1994. Lancaster: The Pali Text Society, 2006. Osborne, Katherine. Presocratic Philosophy: A Very Short Introduction. Oxford: Oxford University Press, 2004. Rhys Davids, T.W. Dialogues of the Buddha. London: Oxford University Press, vol. 1, 1899. Sankrityayan, Rahul and others. Buddhism: The Marxist Approach. New Delhi: PPH, 1978 (first published 1970). Selsam, Howard, David Goldway and Harry Martel (eds.). Dynamics of Social Change: A Reader in Marxist Social Science. New York: International Publishers, 1983. Sharma, Ram Bilas. “Some Aspects of the Teaching of Buddha” in Sankrityayan and others, pp. 54-65. Thomson, George. Studies in Ancient Greek Society, vol. 2. The First Philosophers. London: Lawrence & Wishart, 1955. This paper first appeared in Psyche and Society (9:1, May 2010, 55-60), the organ of Pavlov Institute, 98, Mahatma Gandhi Road, Kolkata – 700007.